With the 54th Girl Scout National Conference session convening this week in Columbus, OH, I decided to refresh the look and content of the Girl Scout History Project. 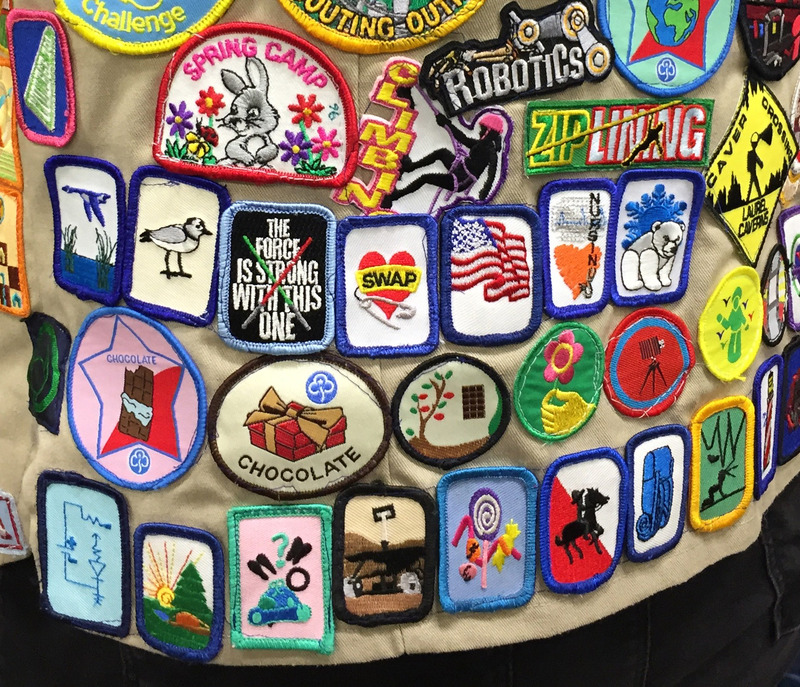 “Digital Daisy” was designed by an Illustration major from the Savannah College of Art and Design, which gives the image an extra dose of Girl Scout history. 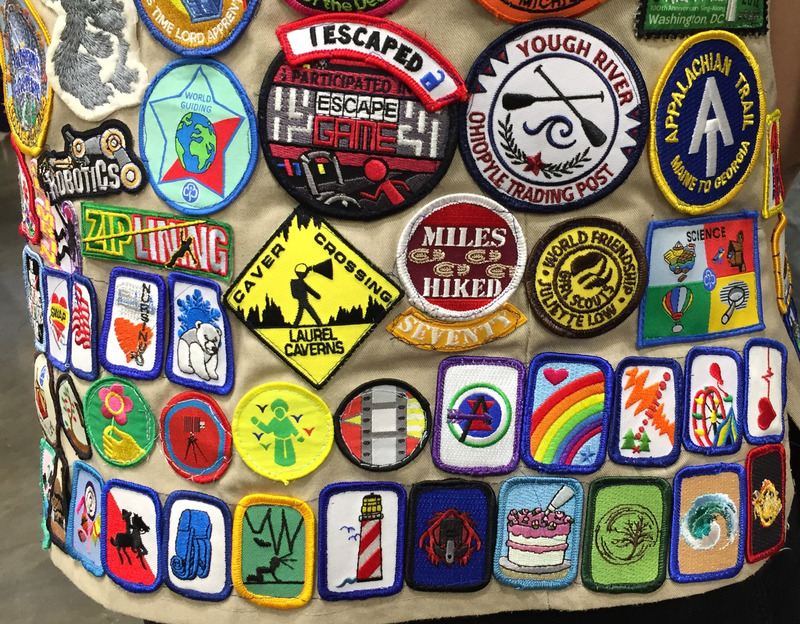 I’d hoped to have patches made to use as SWAPs at the convention, but time ran out. 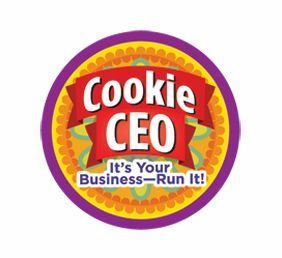 I do have some stickers and business cards. Look for the Daisy tote bag! I’m still not convinced “Digital Daisy” is the best nickname, so suggestions are welcome! 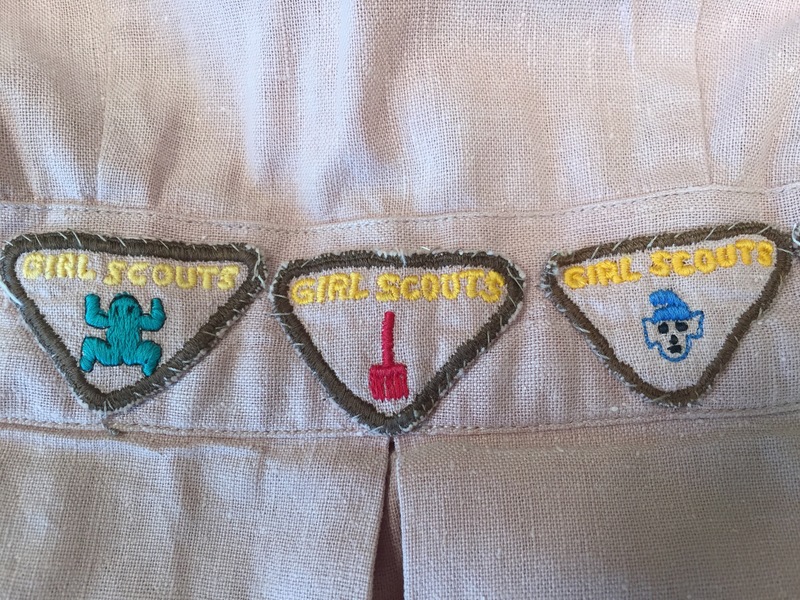 I promised a better look at our newly acquired, hyper-adorable uniform for Brownies in the Philippines. I don’t have many hard facts about this uniform, but there are plenty of clues. The dress has no labels or manufacturing marks, so it likely was homemade. It is pale brown linen. A card in the pocket says it was donated by Mildred “Connie” Conrad in March 1987, but it is obviously much older. This was part of a large donation that included flags for every country represented; the US flag included only has 48 stars, suggesting the 1950s or earlier. 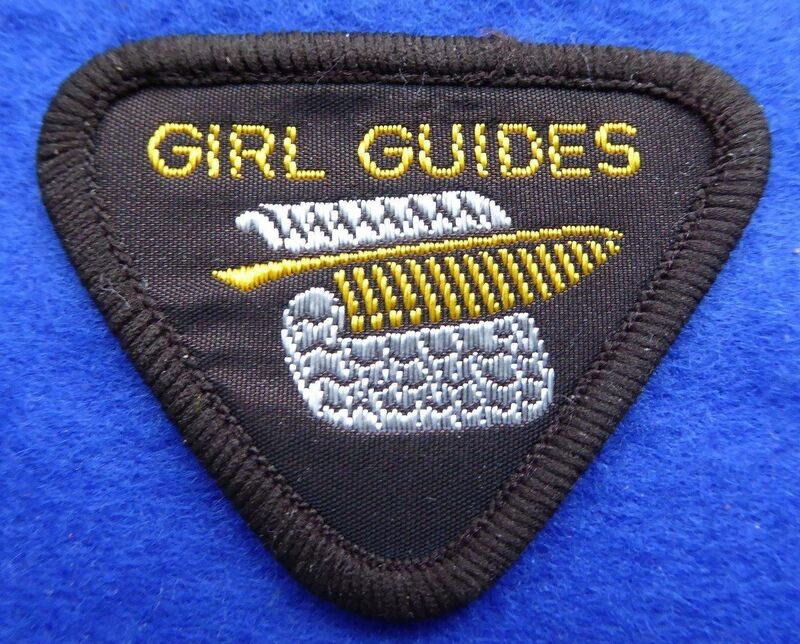 The Philippines is an exception to the “Girl Guides” naming pattern used by most countries in the World Association of Girl Guides and Girl Scouts. The first troops in the Philippines were established by families of US servicemen stationed there. 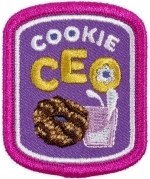 They were registered in New York as Girl Scouts, much like Troops on Foreign Soil. The original charter for the Philippines was issued in May 1940, but the organization had to be significantly reorganized and revived after World War II. 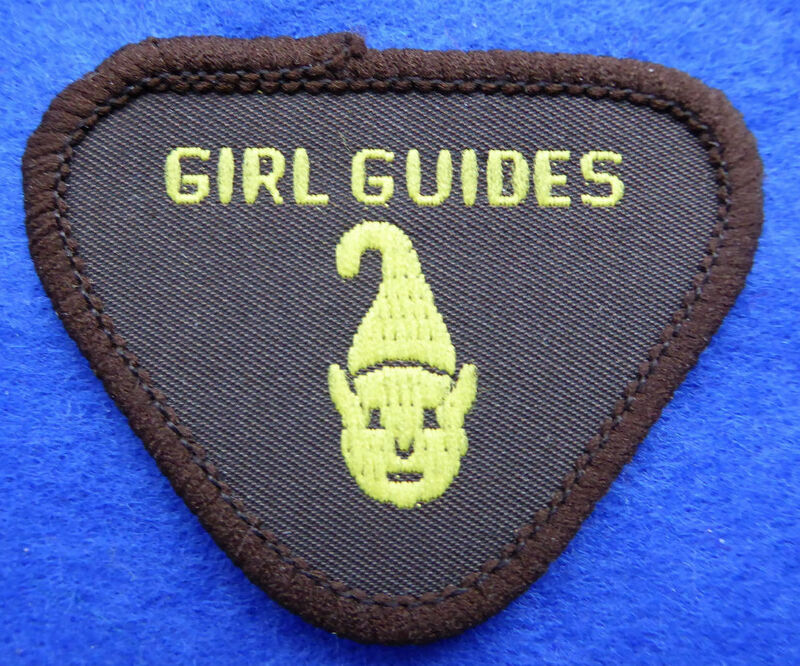 The Golden Bar rank represented a bit of the Golden Ground that the Brownie stands on ready to lend a hand. 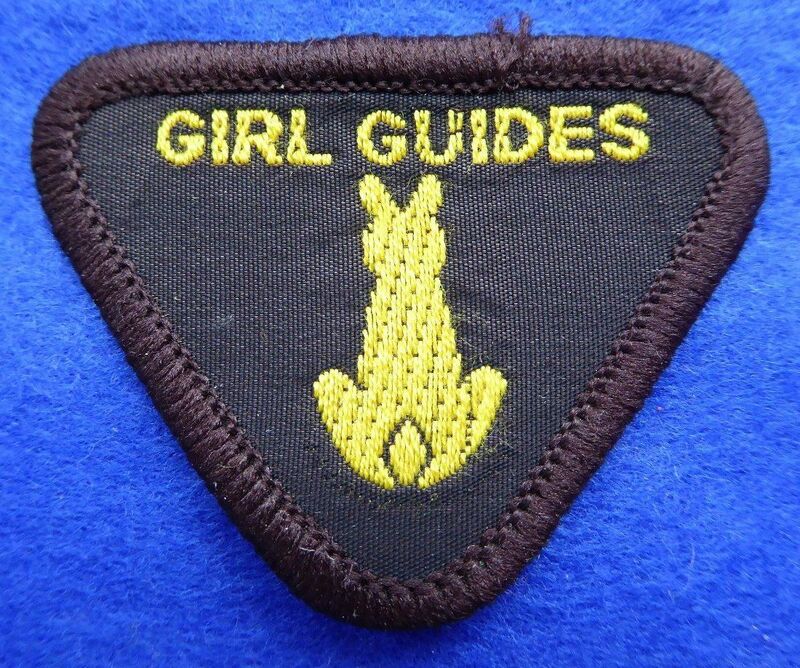 The Golden Hand rank showed that the Brownie could really lend a hand. 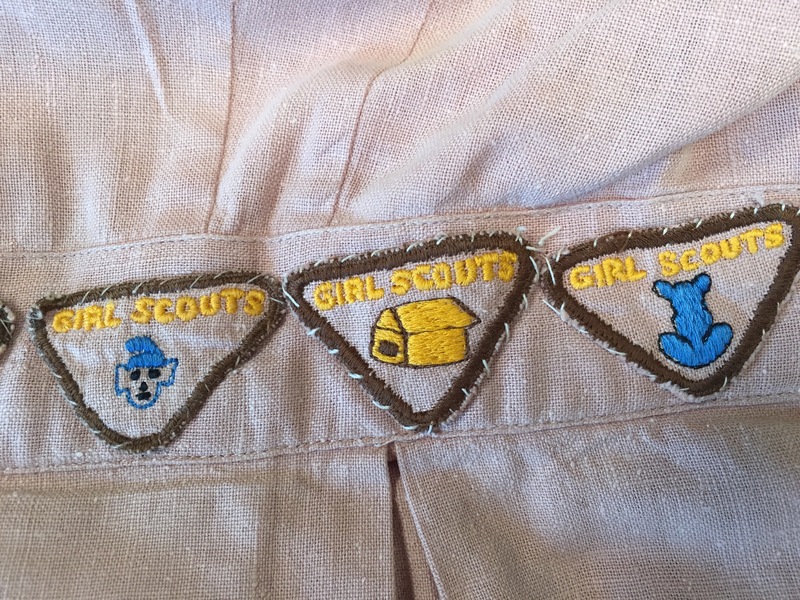 The other shoulder has a Brownie Six emblem, council strip, and troop number. 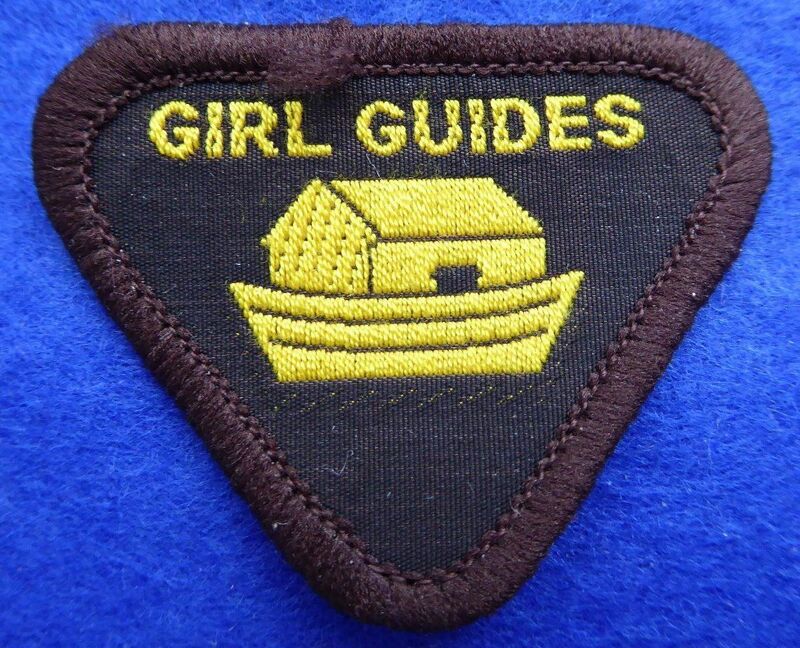 This looks like the “Little People” emblem, which was introduced in 1929. 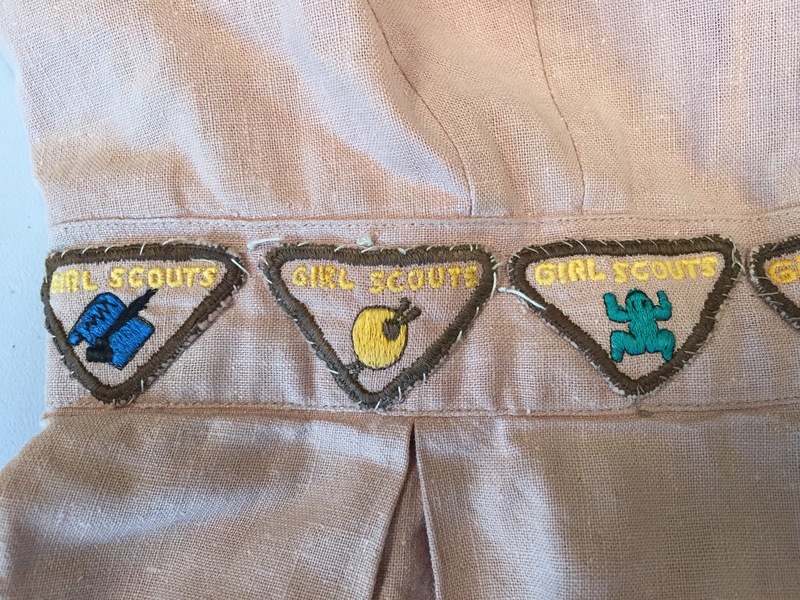 The dress includes eight badges, sewn around the waistband. 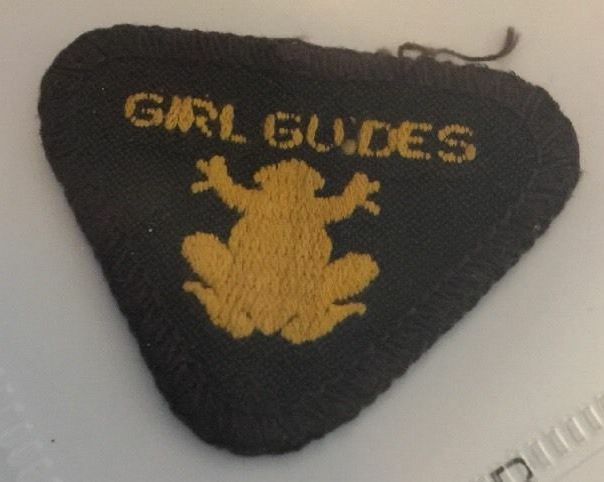 These resemble badges earned by Girl Guides, especially as US Brownies did not earn badges before 1986. 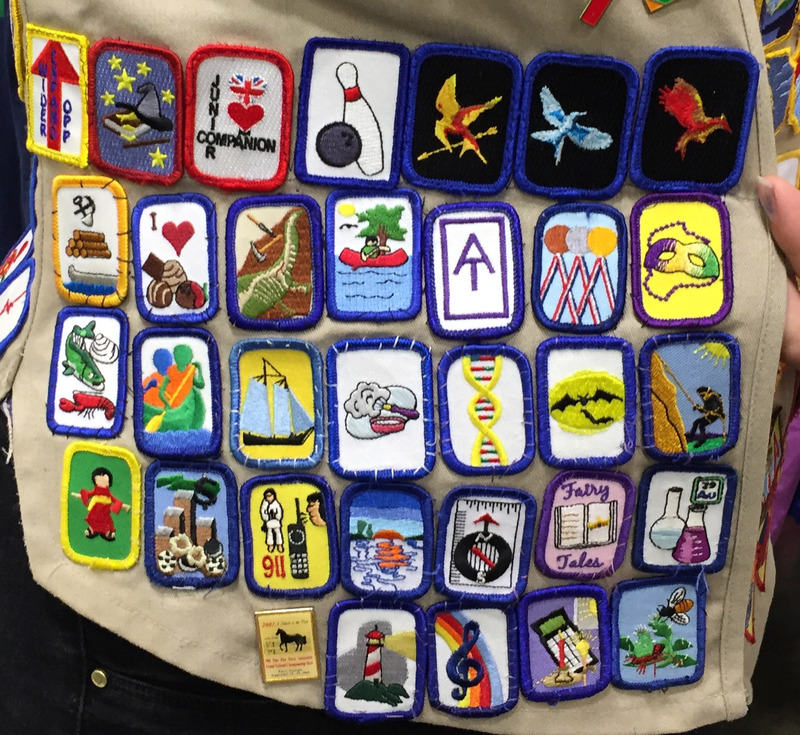 Now, for the hard part, can anyone identify the badges? 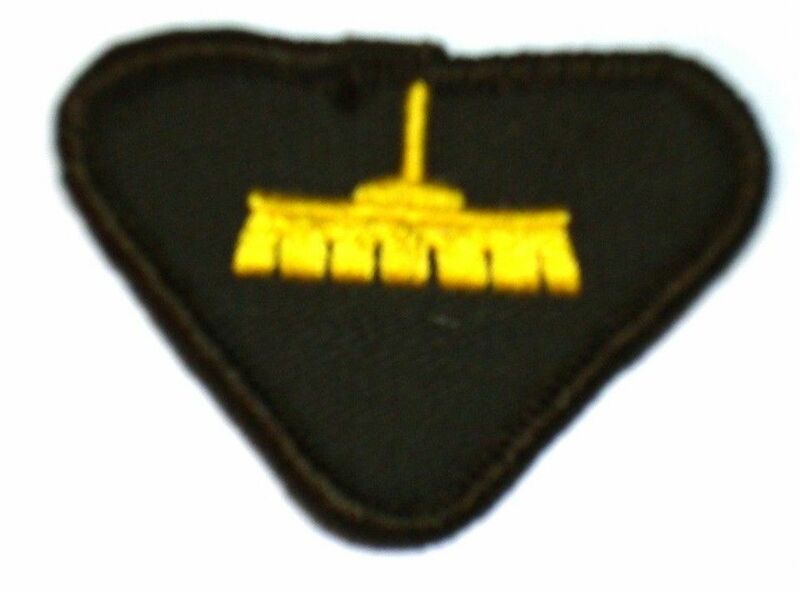 Badge #8 is on the back of the dress. Perhaps Softball? Athlete? I’ll share some of the other vintage uniforms, but don’t promise to do all 50!